Roots. Directed by Marvin J. Chomsky, John Erman, David Greene, and Gilbert Moses. Written by William Blinn, James Lee, M. Charles Cohen, and Ernest Kinoy. Adapted from the novel of the same name by Alex Haley. Release Date: January 23 to January 30, 1977. I was annoyed when I first learned about the remake of the 1977 Roots miniseries because I generally do not like when classics are “re-imagined.” Apparently, the inspiration came from Mark Wolper (son of the original producer, David Wolper), who received only a tepid response when he showed the original to his 16-year-old son. Wolper took this to mean Roots was too dated for current audiences and resolved to update it for a new generation. He enlisted LeVar Burton (Roots‘s original star) as executive producer and the resulting miniseries will air over four nights, starting Memorial Day. I watched much of the original when I was a kid and then again in the late 90s. With the new one set to air, I decided to revisit the original to judge for myself whether the remake is necessary. 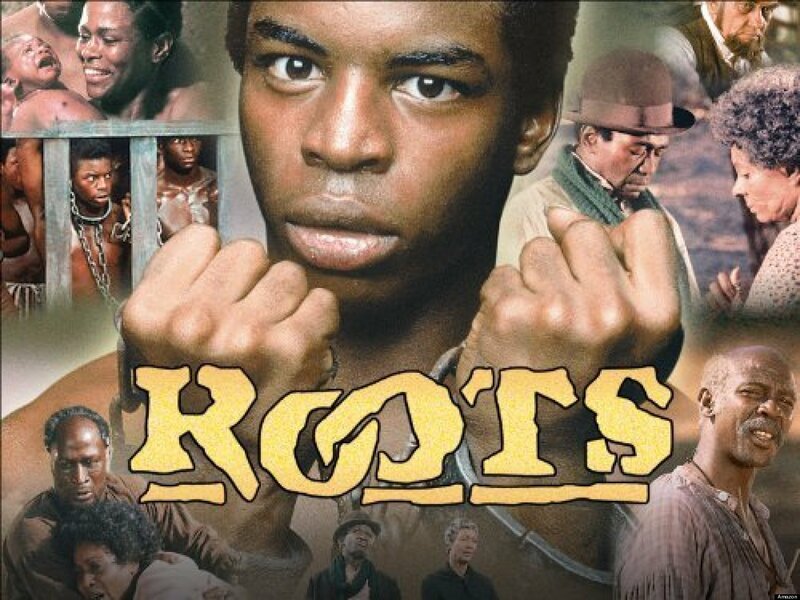 Airing on ABC over eight nights in January 1977, Roots was a true phenomenon. Average nightly viewership was around 80 million, with most episodes immediately placing among the top 10 highest-rated shows of all time (the finale remains #3). Amazingly, 85% of all homes with televisions tuned in (in the 70s, most people only had three TV station options, but this is stunning nonetheless). It was a shared cultural event, with even many bars turning off sports and switching to this gripping adaptation of Alex Haley’s Pulitzer Prize winning book about his African ancestor, Kunta Kinte, along with Kinte’s daughter Kizzy, his grandchild Chicken George, and his two great grandchildren. The success took television executives by surprise, spawning a historical miniseries craze (Winds of War, The Blue and the Gray, North and South). Roots also earned 37 Emmy award nominations (9 wins), a Golden Globe, and a Peabody. More important, Roots was the first brutally honest popular depiction of American slavery. Previous movies and shows characterized the institution as largely benign, with Gone with the Wind leading the way. Although originally released in 1939 (and re-released multiple times thereafter), Gone With the Wind received its first television airing in 1976, instantly becoming the highest rated show of all time. Roots displaced it a year later by rejecting the old portrayal of loyal slaves who loved, willingly served, and faithfully protected their masters, in favor of a more realistic image drawn from the slaves’ own perspective. This change reflected historical works in the 1970s that effectively challenged traditional interpretations of slavery. Older histories largely portrayed slaves as mostly ignorant and docile “Sambos.” Such works stripped the enslaved of their humanity, with their identities and self worth coming from the esteem and trust they earned from their masters. Yet many of the historical works published in the 1970s demonstrated that slaves held on to many African traditions, and created their own cultures and sense of self worth. Over eight nights, Roots presented these newer ideas to a massive audience, reaching more people than academic historians ever could. Because Haley’s book focused on the black perspective, ABC worried the show would not appeal to white audiences. The network insisted on more white characters and beefier parts for those already there. Many critics justifiably complained about these additions, but casting choices made the end results intriguing. Famous TV actors eagerly signed on to play against type. The Mary Tyler Moore Show’s grumpy but lovable Ed Asner portrayed a conflicted slave ship captain. The Walton’s morally steadfast father, Ralph Waite, played Asner’s first mate, encouraging the captain to gratify his sexual desires by taking a female slave every night as a “belly warmer.” Bonanza’s heroic patriarch, Lorne Greene, was a plantation owner that splits a slave family up through sale. Robert Reed, the all-American dad from The Brady Bunch, also breaks up a slave family and has an illicit affair with his brother’s wife. Wholesome Disney star (and quintessential Peter Pan) Sandy Duncan played his daughter, memorably explaining white racial superiority to her childhood friend Kizzy, and later doing nothing as her enslaved friend is sold away from her parents. Chuck Conners, The Rifelman’s tough but tender father, repeatedly rapes Kizzy (and his other slaves), fathering Kunta’s grandchild Chicken George (a charismatic role that made Ben Vereen a star). The Addams Family’s Morticia, Carolyn Jones, played Conners’ long suffering wife, who tries to kill Chicken George with a shotgun. Perpetual good guy Lloyd Bridges is the show’s nastiest villain, a Confederate officer that leads the local KKK after the war. Even grandfatherly Burle Ives (“have a holly jolly Christmas!”) shows up as a Reconstruction-era politician intent on restoring white supremacy. ABC cast these actors to attract larger audiences, but seeing them in these roles was powerfully jarring at the time. For those of us who grew up on 60s and 70s television, it still is. The black actors were equally recognizable. Good Times’ stern father, John Amos, played the adult Kunta. Madge Sinclair, who was a staple on 70s television, movingly portrayed Kunta’s stubborn and resourceful wife. Well known for appearances in many shows including I Spy, Leslie Uggams plays Kizzy, earning an Emmy for the demanding role. Perhaps most famous is Cicely Tyson, doing a brief turn as Kunta’s mother. Even Lawrence Jacobs from Welcome Back Kotter (Freddy “boom boom” Washington) had a small but pivotal role. Yet, the most interesting casting was that of Richard Roundtree. Audiences were accustomed to him as the smooth-talking badass detective from Shaft and his first appearance in Roots perfectly fits that mold; a cocky, well dressed lady’s man who woos Kizzy. Roundtree’s persona makes it all the more rattling when, after getting scolded by his master, he quickly turns servile, pathetically begging for mercy on his knees. Because this is unlike her proud father Kunta, Kizzy immediately recoils from him, but seeing Shaft buckle to a white man like this most likely shook 1970s audiences. Despite these brilliant casting choices, much of the acting ranges from mediocre to poor (O.J. Simpson’s cameo is so awful it’s painful to watch). There are some major exceptions, however. Louis Gossett, Jr., is brilliant throughout in the key role of Fiddler. Vic Morrow delivers an exceptional performance, portraying a cruel but effective overseer. In his first role, LeVar Burton’s acting as the young Kunta is uneven, but he has moments of brilliance. The collective talents of Morrow, Gossett, and Burton created the most famous slave-whipping scene in history. While not as graphic as similar scenes in recent movies like 12 Years a Slave, the hours of buildup make it more powerful. Born the son of a Mandinka warrior, stolen from his homeland, and sold to a colonial Virginia slaveholder, Kunta refuses to fully submit and completely surrender his African identity. In contrast, Fiddler has seemingly long been broken by the system. He takes pride in the privileged status he has obtained because he’s musically talented and considered dependable by his master. After a runaway attempt, the overseer has enough of Kunta’s defiance and decides to break Kunta by whipping him until he answers to Toby.” The brutal scene’s most powerful moment comes after the whipping, and from a line Gossett reportedly improvised. Holding the physically broken Kunta in his arms, Fiddler encourages him to keep holding on to his name, “you know who you be,” he says, “and that’s who you always gonna be.” Then with tears streaming down his face, Fiddler tells Kunta, “there’s gonna be another day. You hear me? There’s gonna be another day.” In this moment we realize that, despite being born enslaved and living his entire lifetime in the institution, Fiddler, like Kunta, has never truly been broken or accepted his slave status. This is powerful television, and important historical interpretation. Unfortunately, there are some glaring inaccuracies and deficiencies. For instance, Kunta’s enslavement comes almost exclusively at the hands of European slavers, glossing over the participation of West African kingdoms in the Atlantic slave trade. During the show’s colonial era, slaves refer to freedom being obtainable by fleeing to the northern colonies, when in fact slavery was legal there too. Colonial characters also discuss the abolitionist movement, which would have been more appropriate in an antebellum setting. Strangely, we do not see much physically demanding labor, and the interior of the slave cabins often appear comfortable and quaint. Roots nicely shows the differing reactions of whites and blacks to the Civil War, but never makes it explicitly clear the South seceded to defend slavery. Frustratingly, the war seems of little concern to the enslaved, and then just suddenly frees them. African American agency and involvement in the Civil War is completely missing. Despite these weaknesses, the series does many things exceptionally well. By starting the story in Africa, it effectively demonstrates that African Americans are descended from a proud heritage that predates enslavement. The horrors of the Middle Passage, though sanitized for television, are stunningly depicted. Perhaps the most emotionally distressing scene is when Kizzy is sold from her mother and father, and this is appropriate considering slaves feared separation from family even more than whippings. Most important, the characters do not accept enslavement, and engage in different modes of resistance in large and small ways. Some of this resistance is overt (an attempted revolt during the Middle Passage, Kunta’s running away, Nat Turner’s rebellion, outwitting the KKK) but most of it is accurately subtle—reliant on building identities, relationships, and a shared culture outside of white control. Even slaves with privileged status yearn for freedom and those with “good masters” still understand life would be better outside of slavery. In the end, the show’s greatest contribution is depicting the enslaved as survivors, not passive victims. So is there a need for a remake? The original Roots reflected very current slave interpretation, sparking the interest of a new generation of historians. As a result, we now know a lot more about the west African kingdoms from which most American slave were taken, the different forms of resistance, and black participation and agency during the Civil War. The original looks and feels too much like 1970s television. Today’s networks have bigger budgets and cinema-quality production values, which will likely result in more realistic set design, make-up, and better acting. Still, perhaps the biggest reason for a remake is that part of what made the original Roots so powerful was casting that used familiar faces in ways that jarred audiences. For audiences that did not grow up on 1960s and 1970s television, this is lost. Perhaps it is indeed time to captivate a new generation with this powerful story. On June 7, the original Roots will be available for the first time on Blu-ray. While the original broadcast had eight installments, producers later edited it down to six. This is the version that up until now has been available on DVD. Some pivotal scenes between young Kizzy and young Missy Reynolds (played by Tracey Gold who went on to star as Carol Seaver in the classic 80s TV series Growing Pains) were cut. The new Blu-ray edition restores the series to its original eight installments. One humorous inaccuracy is the large mountain range that forms the immediate border of a slave planation in Spotsylvania County, Virginia. Cleary, the producers of the show had never been there. Watching a young Ian McShane (most famous today from his role as Al Swearengen in Deadwood) playing a bit role as an English cockfighter is almost as interesting as seeing the perpetually well-tanned George Hamilton play Richard Roundtree’s master. As mentioned, O.J. Simpson’s cameo is hilariously bad, but not just because of his acting. TV audiences accustomed to seeing him in commercials running through airports were treated to a completely unnecessary scene in which he chases down and easily outruns Kunta Kinte. I guess the producers decided to use his best asset, since it obviously wasn’t his acting. The best parts of the series involve Kunta and Fiddler, and it definitely loses steam once they pass away. The last two episodes in particular are far inferior to the rest of the series. It will be interesting to see if the remake has a similar problem or if it sustains momentum throughout. Does it mention slavery? Obviously, effectively presenting then-current slave historiography to audiences. If the new one does the same, we are in for an interesting four nights of television.